With an arsenal of restaurants in his belt, including The French Laundry, Per Se, Bouchon, Bouchon Las Vegas and several Bouchon Bakeries - at the Venetian in Las Vegas, for instance, and downstairs in the Time Warner Center - you would think that Chef Keller has his hands full. That's an understatement, as Chef Keller is truly a busy man, Apart from his restaurants, he's also the author of two cookbooks and has designed a line of dinnerware with food presentation in mind. Created in collaboration with Bertrand Raynaud in Limoges, France, the dinnerware is made of white porcelain and features a sleek, modern design. The collection, including a platter that is reportedly the first ever to feature a shape that was designed by a chef, is sold by such upscale retailers as Gumps and Bergdorf Goodman. 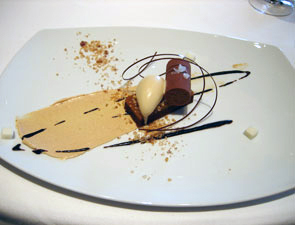 It's called Point, in honor of the late Fernand Point, widely touted as the father of modern French cuisine. As if that weren't enough to keep one man busy, Chef Keller has also created a cabernet, Modicum, that is produced by Napa Valley Winery Harlan Estate. You're not alone if you're wondering how someone so busy can continually produce consistently excellent American fare with just the right hint of classical French Influences. It's best not to ask such questions; instead, it's better to simply taste and enjoy! When we first visited Per Se, there were three menu choices, all prix fixe: a nine-course, a seven-course and a vegetable tasting menu. It appears that now the restaurant offers two choices, both of which include nine courses that change daily. The cost for each is $250 and includes service in lieu of a gratuity. While Chef Keller created quite a stir among his peers when he created the policy, Per Se remains as popular as ever among his customers. Lunch and dinner menus are exactly the same and change daily in order to showcase the season's freshest produce and ingredients. 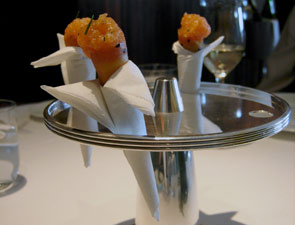 If you're lucky, you'll wind up with an amuse bouche of salmon tartare ice cream cones that are simply scrumptious.